Fitness, as we know it today, seems to be a relatively modern invention – something that started vaguely in the 70s with jogging and Jazzercise. But physical exercise obviously goes back much further than that, to a time where people wouldn’t have thought of it as working out, but rather a way of life. 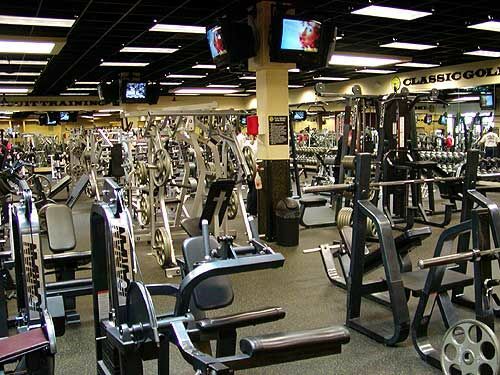 Centuries and millennia ago, they did not have all the machines and weights and gyms that we have today, and yet they were in better shape than we are. To understand why this is, how we got to our modern fitness culture, and what we have lost along the way, it’s helpful to take a look at the history of exercise. 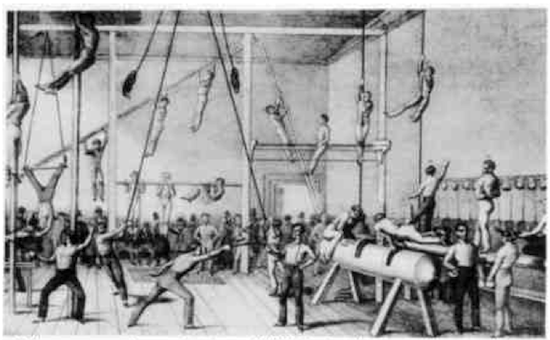 In a previous article on the philosophy of “MovNat,” I briefly talked about the history of physical training before there were modern gyms and workout programs. This article is a more detailed overview of exercise throughout time, from its ancestral origins, to the early history of physical education in Europe and America, to today’s plethora of fitness modalities, sports, and activities. Primal Times: Move For Your Life! 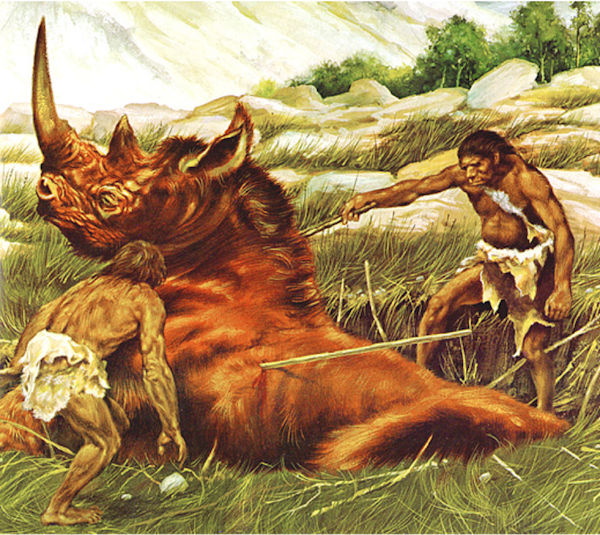 From the dawn of humankind to around 10,000 BC, men had a constant voice in the back of their head saying, “Run for your life!” Physical development followed a natural path that was determined by the practical demands of life in a wild landscape as well as the vital need to avoid threats and seize opportunities for survival. One’s movement demands consisted of locomotion, the manipulation of tools and natural objects (rocks, tree limbs, etc. ), and defense. To survive in a harsh environment full of natural and human obstacles and enemies, early man had to know not only how to run, but also walk, balance, jump, crawl, climb, lift, carry, throw and catch things, and fight. We can also safely assume that playful or creative moves like early forms of dancing were performed when bellies were full and predators weren’t around. The strength and mobility of early man was not developed through structured programs, methods, or schedules, but rather was forged by the daily, instinctive, necessity-driven practice of highly practical and adaptable movement skills. Today, the few hunter-gatherer tribes which still exist around the world would have no idea what “primal fitness” or a “caveman workout” is, as this kind of “exercise” remains deeply ingrained in their everyday lives. 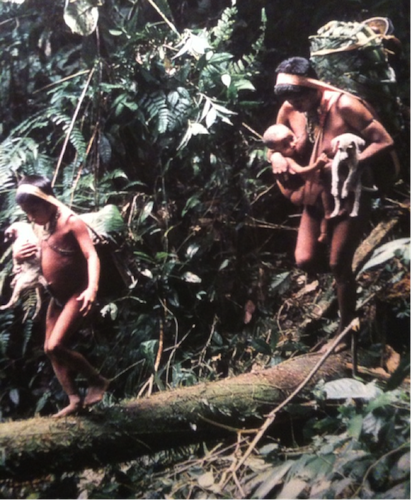 In hunter-gatherer tribes, everyone had to be strong — men, women, and children alike. Here we see walking, balancing, and carrying — all at once. It doesn’t get any more “functional” than this. Starting between 10,000 and 8,000 BC, the Agricultural Revolution is often considered to be the dawn of civilization. Man’s transition from nomadic hunter-gatherer to farmer led to dramatic changes in his physical activity. The numerous demands of growing food and raising cattle meant a lot of chores and a lot of daily labor for farmers. But these tasks were largely repetitive, and required a very limited range of movement. At the same time, the need for performing a variety of complex movements — running, balancing, jumping, crawling, climbing — greatly diminished. Such movements were rarely performed in a farm environment, or were performed in much simpler ways; for example, climbing a ladder is safer and more constrained and predictable than climbing trees. Between 4,000 BC and the fall of the Roman Empire in 476 AD, civilizations rose and fell through war and conquest. Assyrians, Babylonians, Egyptians, Persians, and later on, the Greeks and Romans all imposed physical training on boys and young men. The purpose? Preparing for battle. 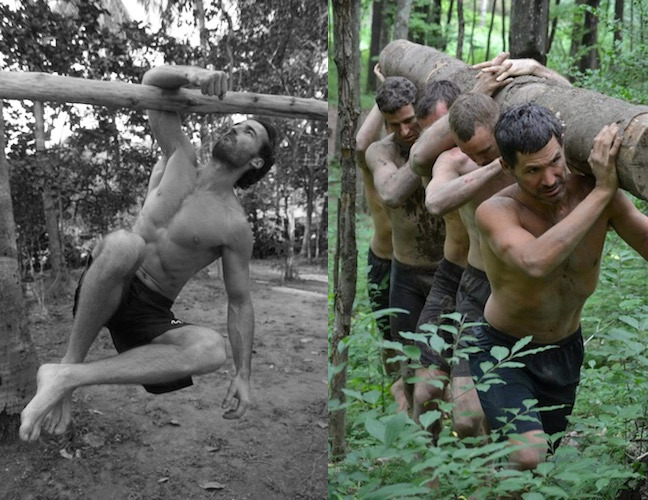 Ancient military training had similarities to the movements performed in nature by our cavemen brethren, but with more structure and a different end goal. Young men practiced fundamental skills such as walking and running on uneven terrains, jumping, crawling, climbing, lifting and carrying heavy things, throwing and catching, unarmed fighting, and weapons training. Civilized populations valued physical culture for sports as well. 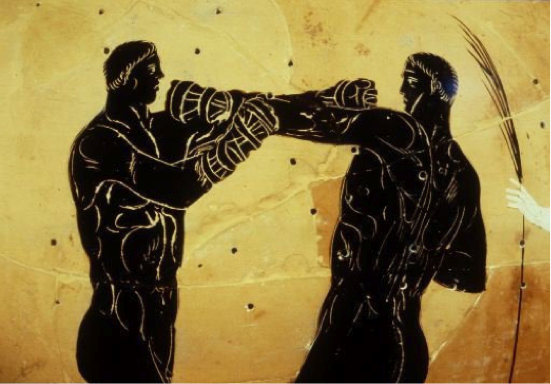 Records of athletic competitions exist from ancient Egypt, and of course, the ancient Greeks famously created the first Olympic games. 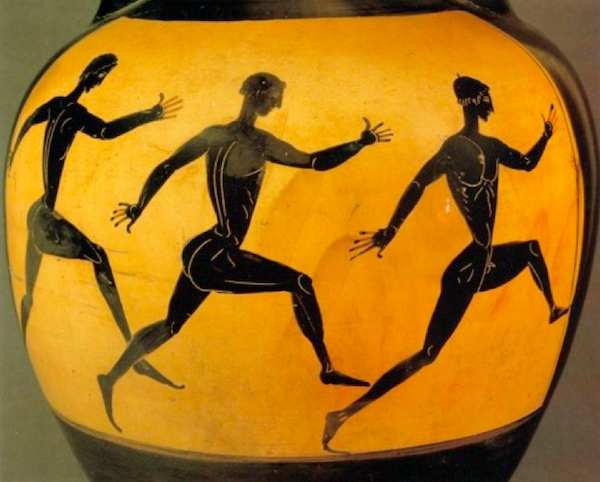 Not surprisingly, these early sports were all based on practical, natural movement skills and were fundamentally related to the preparedness needed for war — the Greeks strove to best each other in running (sometimes with armor and shield), jumping, throwing (javelin or discus), and fighting (striking and wrestling). 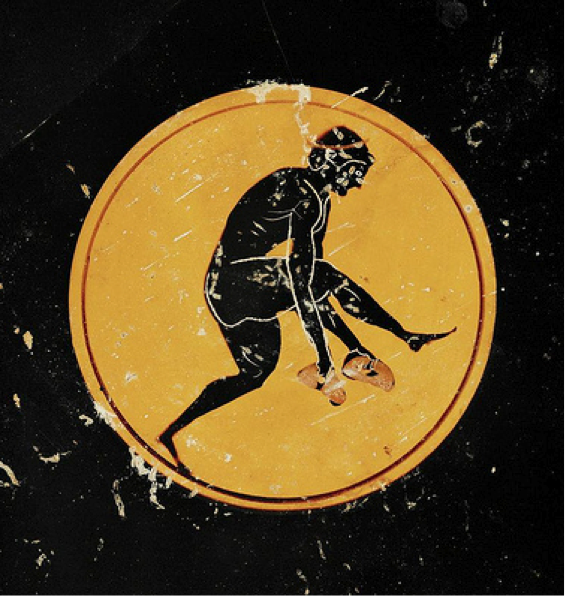 The images above demonstrate the sports the Greeks trained for and competed in during their Olympics games. 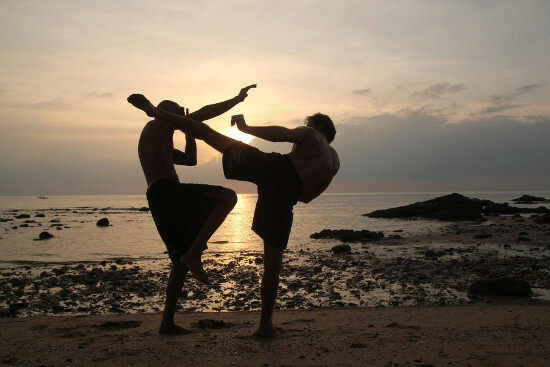 The events concentrated on natural movements, like running, and martial skills, like fighting. 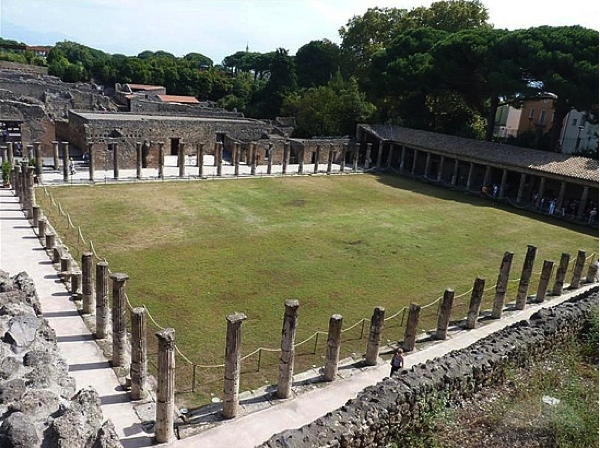 Remains of a “gymnasia,” an early version of our modern gyms. Antique sculpture representing ideal athleticism. Lasting from the 5th to the 15th century, the Middle Ages were a chaotic period with a succession of kingdoms and empires, waves of barbarian invasions, and devastating plagues. The teachings of Christianity spread the belief that the primary concern of one’s lifetime was preparing for the afterlife. The body was seen as sinful and unimportant — it was a man’s soul that was his true essence. Education was overwhelmingly connected to the Church, and focused on cultivating the mind rather than training the body. 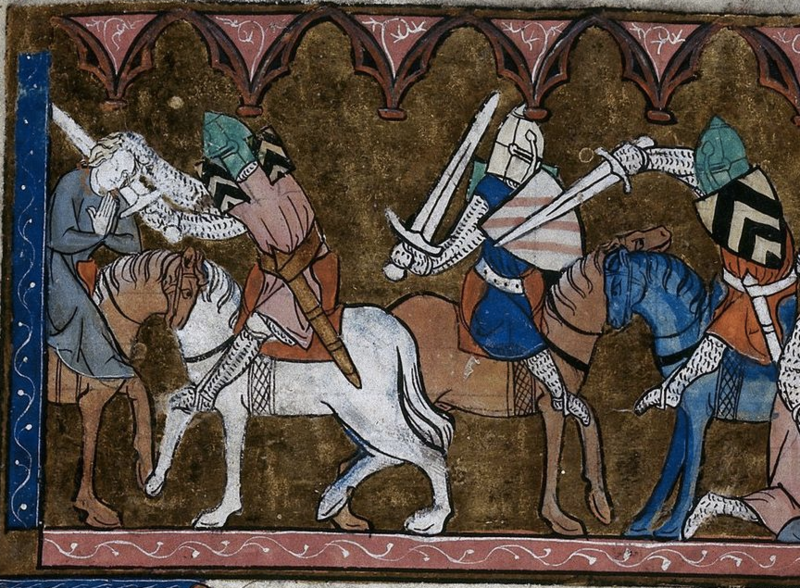 Under feudalism, the dominant social system in medieval Europe, only nobles and mercenaries underwent physical training for military service. Similarly to ancient times, their training centered on natural movements and martial skills. 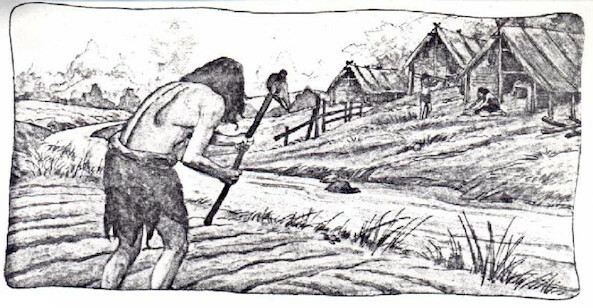 The rest of the population were mostly peasants obliged to live on their lord’s land and work extremely hard in fields using rudimentary tools. Their “exercise” came through hard labor. 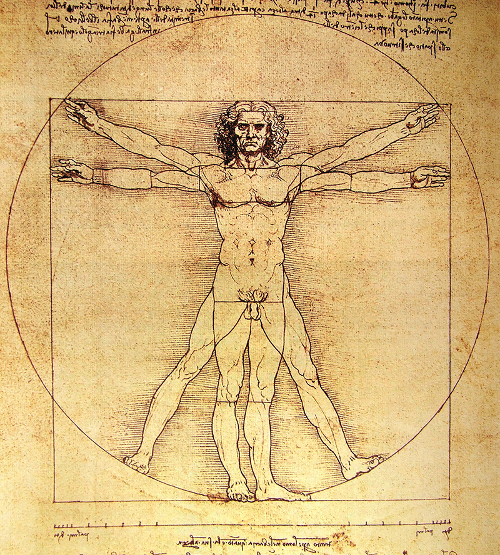 The Renaissance Era (from around 1400 to 1600) prompted a much greater and open interest in the body, anatomy, biology, health, and physical education. In 1420, Vittorino da Feltre, an Italian humanist and one of the first modern educators, opened a very popular school where, beyond the humanist subjects, a special emphasis was placed on physical education. 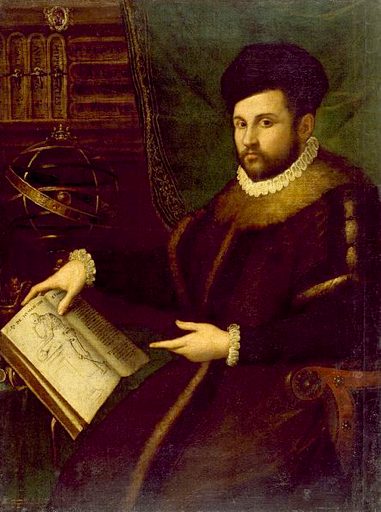 In 1553, El Libro del Ejercicio Corporal y Sus Provechos, by Spaniard Cristobal Mendez, was the first book to exclusively address physical exercise and its benefits. In the book, exercises, games, and sports are classified, analyzed, and described from a medical standpoint, and advice is offered on how to prevent and recover from injuries resulting from these physical pursuits. Several chapters even provide specific advice on particular drills and games for women, children, and the elderly. 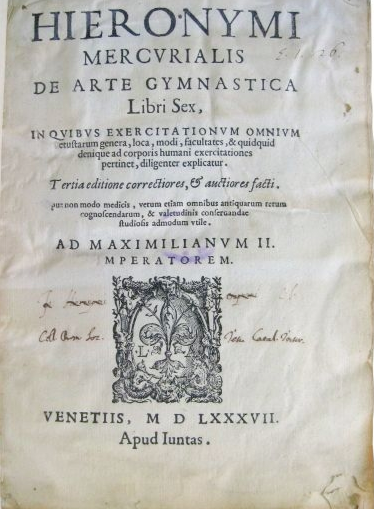 16 years later, Mercurialis, an Italian physician, published De Arte Gymnastica. It was the culmination of his studies of classical and medical literature, particularly the ancient Greeks’ and Romans’ approach to hygiene, diet, and exercise, and their use of natural methods for the treatment of disease. Laying out the principles of physical therapy for the first time, and accompanied with beautiful illustrations (even though they were largely creative speculations), it is considered the first book on sports medicine, and strongly influenced the wave of physical education and training methods that started to emerge in Europe two centuries later. 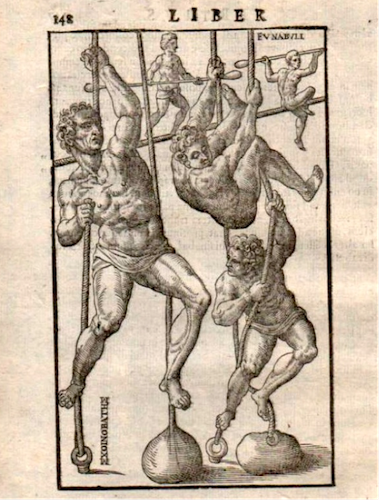 Climbing and balancing practice as depicted in De Arte Gymnastica. 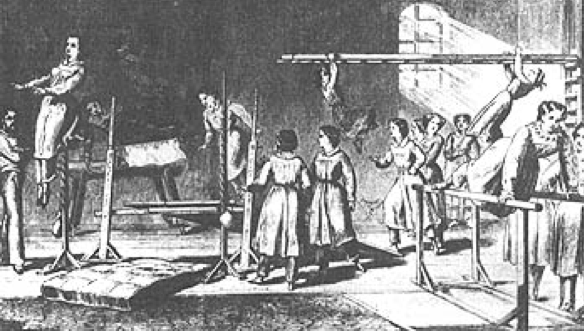 The Industrial Revolution, marking the transition from manual production methods to machine-based manufacturing processes, began around 1760 and quickly generated social, economic, and cultural trends that changed the way people lived, worked, and of course, moved. As people became more sedentary, a new movement towards intentional physical exercise arose. This movement was given a boost in the 19th century from the rise of a nationalistic fervor in many counties in Europe. Staying healthy, fit, and ready to serve in battle became a point of civic duty and pride. 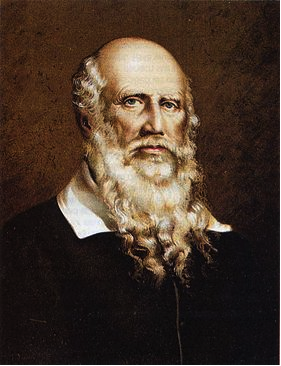 In 1774, Johann Bernard Basedow, influenced by Rousseau’s ideas of the “Natural Human,” opened the Philanthropinum in Germany, with an emphasis on physical exercise and games, including wrestling, running, riding, fencing, vaulting, and dancing. Even the school’s uniforms, which were often heavy and constricting during this time period, were made more comfortable to allow students greater freedom of movement. This model inspired the founding of many similar institutions, and physical training began to become more systemized and included as an integral part of the educational curriculum. Some of the apparatuses designed by Muths. 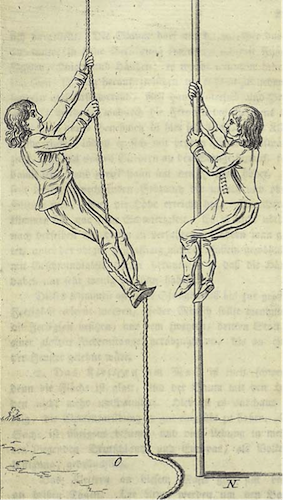 Found in Gymnastik für die Jugend. Climbing vertical pole or rope. In Gymnastik für die Jugend. Twenty years later, Guts Muths, another German teacher and educator, developed the basic principles of artistic gymnastics, for which he is regarded as the “Great Grandfather of Gymnastics.” His Gymnastik für die Jugend (Gymnastics For the Youth), the first systematic textbook in gymnastics, was published in 1800 and became a standard reference for physical education in the English-speaking world. In 1810 Friedrich Jahn came on the physical culture scene. Known as “The Father of Gymnastics,” he was an essential pioneer of physical education, and his ideas spread throughout Europe and America. A German gymnastics educator and ardent nationalist who had lived through Napoleon’s invasion of his country, he felt the best way to prevent another such incursion was to help his people develop their bodies and minds. To this end, he led young men on fresh-air expeditions and taught them gymnastics and calisthenics to restore their physical and moral strength. In 1811, Jahn opened the first Turnplatz, or open-air gymnasium, in Berlin. His gymnastics movement, then called the Turnverein, spread rapidly throughout the country, and in 1816 he published Die Deutsche Turnkunst (The German Gymnastics) dedicated to his gymnastics system. In addition to these contributions to physical culture, Jahn invented the pommel horse and horizontal and parallel bars, and promoted the use of gymnastic rings. The physical culture festivals he sponsored attracted as many as 30,000 enthusiasts, but the essence and end goal of his gymnastics and calisthenics methods were above all practical and functional, not artistic. He advocated the practice of the traditional natural movements like running, balancing, jumping, climbing, and so on. 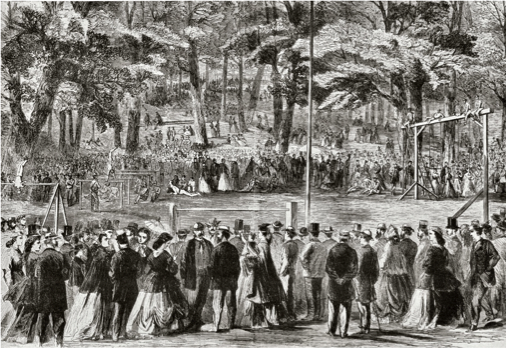 An early gymnastics festival in Germany. Well-informed of this German model, as well as the ancient tradition of athletics, Swede Pehr Henrik Ling developed principles of physical development, emphasizing the integration of perfect bodily development with muscular beauty. 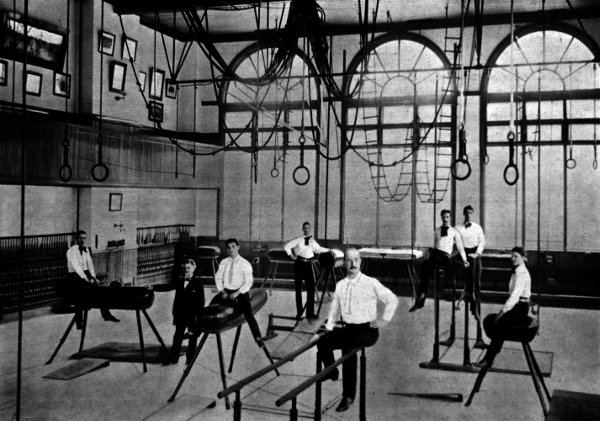 By contrast with the German system, this Swedish system promoted “light gymnastics,” employing little, if any apparatuses (Ling invented wall bars) and focusing on calisthenics, breathing, and stretching exercises as well as massage. Swedish gymnastics had four categories: pedagogic, military, medical, and aesthetic. All movements had to be performed correctly and collectively in a freestanding fashion under a leader’s direction, which differed from the predominant, more mobile, strenuous, and practical German approach. Aspects of this method can still be traced in some modern programs of physical training. Around the exact same time, Spaniard Francisco Amoros founded a military gymnastics school in Madrid, then moved to Paris and established the Normal Gymnastic Civil and Military School in 1819. 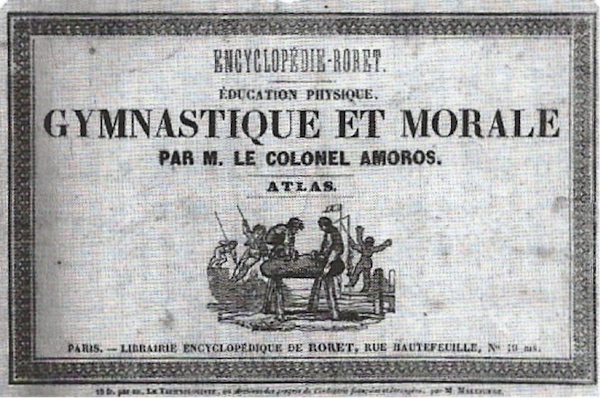 In 1830 he published A Guide to Physical, Gymnastic and Moral Education. After being removed from his position as leader of the army’s physical training program, he opened a popular civilian gymnastics hall in Paris and became the initiator of physical education in France and Spain. 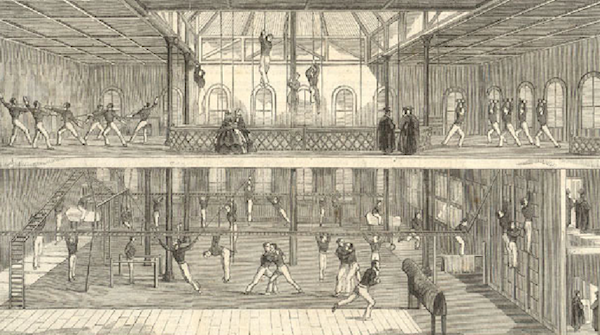 In 1847, French physical culture pioneer and strongman Hippolyte Triat founded a huge gymnasium in Paris where the bourgeois, aristocrats, and spirited youth joined in an enthusiastic pursuit of fitness. In the 1870s after the loss of Alsace-Lorraine to the Germans, the already budding nationalistic mood in France exploded. Physical education became a principal focus in French schools, as battalions of young men were trained to avenge the country. In Scotland, the Highland Games began during the Romantic trend of the 1830s, and included traditional physical challenges distinctive to Scottish culture such as caber tossing, hammer throwing, and the stone shot put, along with running, wrestling, and jumping. The exercise methods developed by German physical culturists influenced English physical education. In England, Charles Darwin’s concept of “survival of the fittest” gave that country’s nascent physical culture movement a boost. Englishmen wanted to be strong enough to rise to the top of nature’s hierarchy. In 1849 the first English athletic competition was conducted at the Royal Military Academy. Scot Archibald MacLaren opened a well-equipped gymnasium at the University of Oxford in 1858, where he trained 12 army officers who then implemented his physical training regimen into the British Army. It is also worth mentioning the Czech Sokol movement. Founded in 1862, this youth sports and gymnastics organization was inspired by the German Turnverein (Gymnastic Movement) and provided physical, moral, and intellectual training for the nation through fitness programs (mostly centered on marching drills, fencing, and various forms of weightlifting), lectures, group outings, and massive gymnastics festivals. This training extended to men of all economic classes, eventually to women, and ultimately to the entire Slavic world. The Polish Falcons (1867) had similar aspirations. In addition to physical training and athletic contests, such cultural groups often sponsored national or traditional dances, songs, and language revivals. Everywhere in Europe people seemed to develop a fitness culture rooted in their ethnic or national identity. As Europe entered the 20th century, French navy officer and physical educator Georges Hebert played a prominent role in moving physical culture forward – and did so by taking a cue from the cultures of the past. Having studied the principles espoused by his predecessors, including Jahn and Amoros, he pioneered his own “natural method.” His method was entirely based on natural movement skills such as walking, running, balancing, jumping, crawling, climbing, manipulative skills (lifting, throwing, etc. ), and self-defense – all of which were often practiced on obstacle courses. Hebert was responsible for the physical training of all sailors in the French navy, and then opened the largest and most modern indoor/outdoor training center in Reims in 1913. An excerpt from one of Hebert’s books. 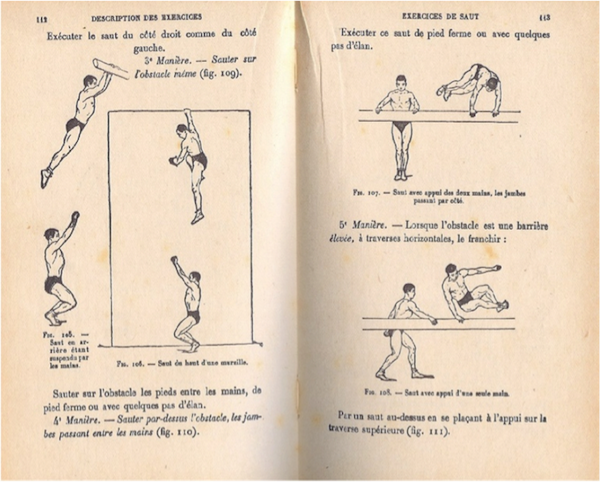 Hebert published his first book, L’Education Physique ou l’Entrainement Complet par la Methode Naturelle (Physical Education or Complete Training by the Natural Method), in 1912, followed by many other works on the same subject. The insights modern man can glean from these seminal works will be the subject of my next post. Since the threat of foreign invasion was never as great in the United States as it was in Europe, the need to prepare for war was not as acute, and thus an emphasis on physical culture came later to this country. Catharine Beecher was one of the first pioneers to create an awareness of fitness in America. As a strong advocate for the inclusion of physical education in schools as well as daily exercises for both sexes, she developed a program of calisthenics that were performed to music. When Beecher established the Hartford Female Seminary in 1823, it was the first major U.S. educational institution for women to implement physical education courses as part of the program. At the same time, European physical culture traditions started to take root in America. 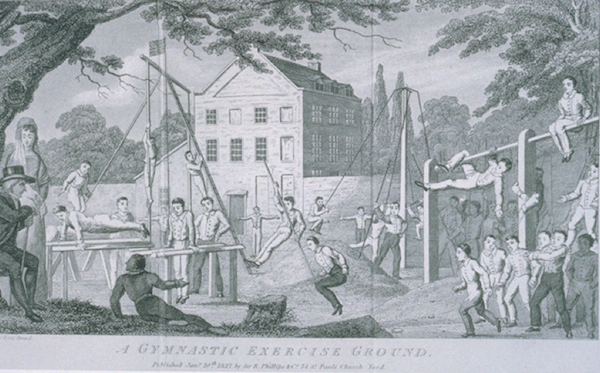 Many “Turners” (German practitioners of Jahn’s gymnastic system) emigrated to the US, and in 1824, German scholar Charles Beck opened an outdoors gymnasium in Massachusetts that was similar to Jahn’s Turnplatz. It was the first gym in the nation and hosted the first school gymnastics program in the country. 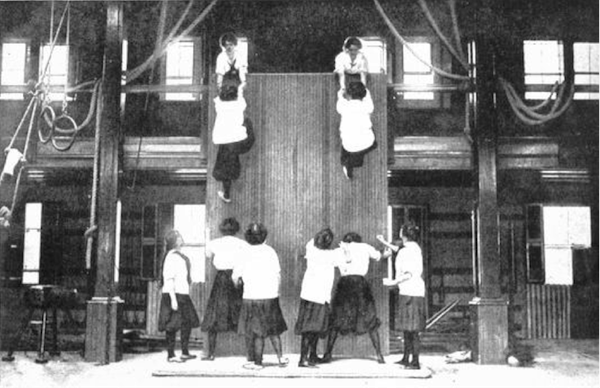 Many other Turners became active in the American public education system and strongly influenced it by opening clubs and teaching gymnastics in various states. One of the most notable practitioners of this European tradition was Dudley Allen Sargent, who is considered to be the founder of physical education in the United States. From 1879 until his retirement in 1919, he was director of the Hemenway Gymnasium at Harvard University, where he taught the German and Swedish systems that he had learned as a young man. Sargent also challenged the Victorian view of females as feeble and prone to fainting, and encouraged freedom of dress and vigorous activity for girls and women. Practical and cooperative physical training. 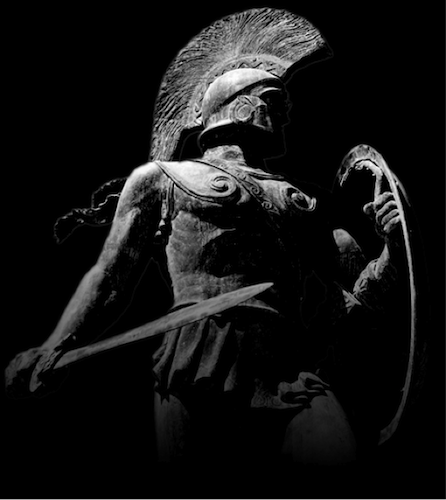 Your great-grandma was training for the Spartan Race, before there was a Spartan Race. The big takeaway from tracing the development of physical culture both in Europe and the US during this period is that these gymnastics systems were all very similar, and mostly based on a practical approach. “Gymnastics” or “calisthenics” at that time did not primarily convey the idea of acrobatics, but more utilitarian movement skills and the strength training that was essential to military preparedness and real-life situations. The exception to this trend was the introduction of apparatuses like the Gymnasticon. 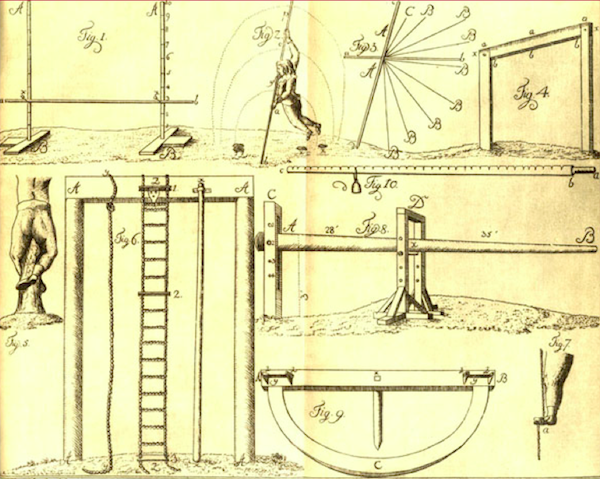 Invented in 1796, it was the forerunner of modern machine-based fitness. The use of fitness equipment would pick up in the 20th century, as would the weights-based, strength-oriented strongman approach to physical culture. These two trends would lead to the modern fitness industry as we know it. The 20th century marked the rise of specialized, competitive sports, as well as the emergence of a well-organized and thriving “fitness” market and industry. 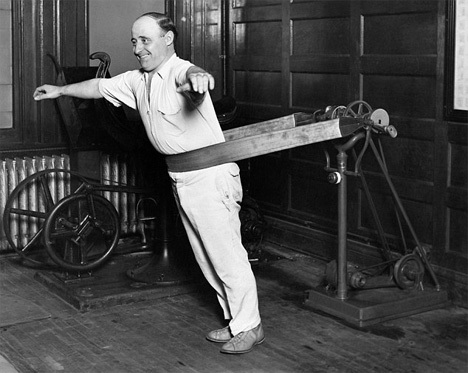 At the very beginning of the 20th century, at the same time Georges Hebert developed and promoted his “Natural Method,” another Frenchman, Professor Edmond Desbonnet, managed to make physical exercise and strength training fashionable through the publication of fitness journals (he used photography to capture male and female athletes) and by opening a chain of exercise clubs. This laid a strong foundation for physical culture in Europe, but also for “fitness” as an industry. Desbonnet’s system was a reaction against the decadence of the Belle Epoque, during which people lived without thinking on their physical condition and health. At the height of his popularity, he had more than 200 fitness centers, and several of the famous early strongmen and bodybuilders were proponents of the Desbonnet method. Being rather expensive, his fitness centers were frequented by the high class of French and European society before World War I. After the war, the working class also started to gain access to the physical culture movement. During the same period in the USA, Bernarr Macfadden came to prominence as an American physical culture guru and healthy living advocate. He recommended a minimalist lifestyle based on time spent in nature, daily vigorous physical exercise, and the elimination of alcohol, tea, coffee, and white bread from one’s diet. 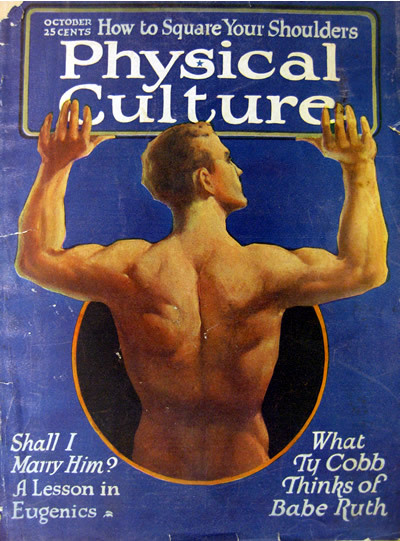 Macfadden started to market a wall-mounted muscle developer that he had created, and founded one of the first muscle magazines, Physical Culture, in 1899. He staged the first physique contest in America in 1903, and similar competitions in 1921 and 1922 fostered the rise of physical culture’s greatest icon, Charles Atlas. By 1935, Macfadden’s publishing empire had a total of 35 million readers, and he died a multimillionaire in 1955. 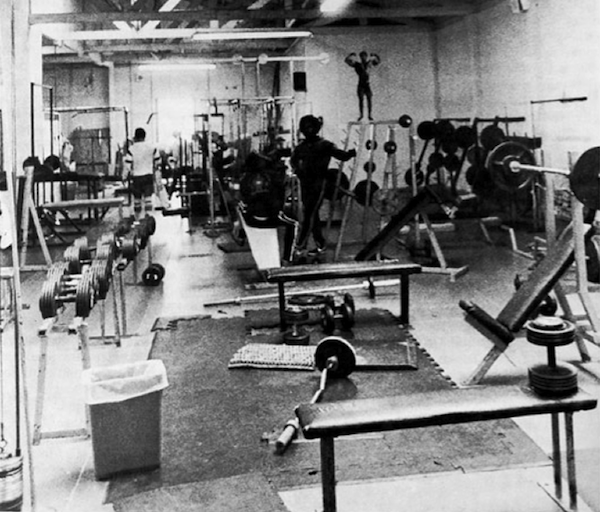 The “old school” gym that emerged in the 20th century…is not so old school after all when looked at as part of a much longer history of physical fitness. Desbonnet and Macfadden can be seen as the precursors of the health and fitness industry as we know it. From there, we enter the age of confusion — the age of fitness-as-business and its many fads, with its current aesthetics-driven, body-building approach, the use of increasingly sophisticated exercise machines in gyms, home equipment, the huge supplement business, countless magazines, books, DVDs, an even now the emergence of tech-based exercise with numerous fitness apps. Over the course of a century, thousands of methods and programs have emerged, all promising to get you in the best shape of your life in the quickest amount of time possible (with results generally being limited to improvements in your physical appearance). This short list is but a sampling of those methods and devices that people have given millions of dollars to in the past century: the vibrating belt, Jack LaLanne’s TV tips and juicing, Jane Fonda’s aerobics, Simmons’s “Sweatin’ to the Oldies” videos, the Bowflex home gyms, Thighmasters, 8 Minute Abs and Ab Rollers, Tae Bo, Pilates, Spinning, P90X, Wii Fit, Power Plates, Sauna Suits, Power Wristbands, and many more. As we reflect on the evolution of fitness over the centuries, and the different facets present in our modern physical culture, it is well to ask ourselves: what have we lost, and what have we gained? Obviously, much good has come out of these recent developments: there’s widespread awareness of the importance of regular exercise, nearly every community has a gym where people can work out, and we understand more about how the human body works and responds to physical training than we ever have before. Yet despite the plethora of health and fitness methods, programs, and resources, the general population has never been so physically sedentary and out-of-shape. A recent World Health Organization report indicates that life expectancy in the U.S. dropped for first time since 1993. The health of modern people is declining, despite highly advanced medical technologies, and in spite of the thriving health and fitness industry. How could that be? Even though we have tons more devices and information about health and fitness than our ancestors did, we are in worse shape. A large part of it is motivation. People are simply not as motivated to move their body and get healthy as they were in the past. We live in a society where the inability to operate one’s body in a practical and effective manner is no longer an embarrassing condition. In my opinion, the health and fitness industry as whole, no matter how “cutting-edge” or “revolutionary” each new program claims to be, has failed to get the majority of people to value, practice, and enjoy physical exercise. Aside from a few exceptions, I believe that the industry has widely contributed to spreading a limited perception of what health and fitness are, and to people turning their back on it. Overwhelmingly, the most common perception of what it means to be fit, and the primary motivation for exercising, is to look fit. It is no longer about having a healthy body that can actually do stuff that is practical to real life. Overwhelmingly, the most common view on how to exercise is that you need machines for cardio and to build muscle and strength so you look good, and maybe add a bit of stretching to the mix (there is equipment for that too). Throw in some vitamins and supplements, and you’re healthy and fit! Overwhelmingly, exercise is a mere chore, not a pleasure; it’s something people have to force themselves to do, not a natural expression of who they are. Last but not least, many who try to address their fitness needs are confused as to what modality to choose. We have lost clarity and simplicity. We have lost a sense of practicality. We have lost naturalness. I see two radically different paradigms of the future of exercise on the horizon. On the one hand, we’re entering the age of ever-more advanced exercise machines that remove people from real life, nature, and what their bodies are naturally designed to do. I see the age of fitness tech, with connected gadgets and their apps, sensors, and wires. The age of “bio-hacking” and exercise efficiency, offering promises like: “Get fit in 3 minutes of exercise a week!” The era of ubiquitous self-quantification where people obsessively check out data curves on a screen, trying to manage their health and fitness in the most scientific way possible. What I see starts to resemble a technological, trans-humanistic approach to the body’s health. Is this really where we should be headed? Despite everything that the health and fitness industry provides, people have never been so physically inactive. So should we expect the answer to this predicament to come from even more varied, or more technologically advanced programs and equipment? Or will the solution come from a different mindset, a simpler approach and practice, and overall a new culture? 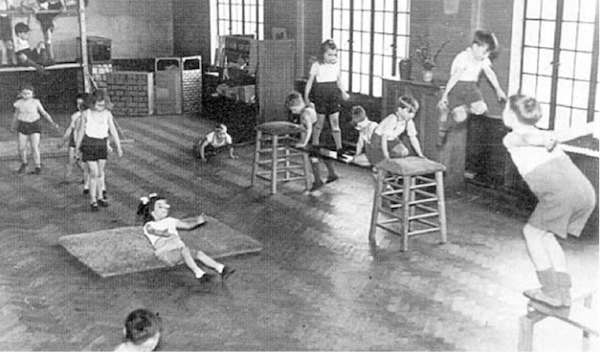 First grade physical education in America in the 50s: walking, running, balancing, jumping, crawling, rolling, climbing. Simple, effective, practical, enjoyable. To become (and stay) strong and healthy, the average Joe and Jane, which most of us are, simply need to move naturally, like all humans used to do not so long ago. We need to practice fundamental movement skills to develop a baseline of physical competence that is useful in real-life, tangible ways. We also need to employ a down-to-earth approach that is practical in both its practice and objectives, which people find enjoyable, that is scalable and progressive, that doesn’t compulsorily require very expensive custom-made equipment, and that can be done in groups. So let me present you with the alternative paradigm that I envision for the future of physical exercise. For thousands of years, physical development followed a natural path; we used to move naturally with the demands of life. Tigers, bears, wild horses, gorillas, dolphins, eagles, etc. still do the same. We are still designed to follow evolution and nature. For hundreds of years, our predecessors have trusted in a design that provided immediate usefulness and practical benefits to their lives. Natural movement, or practical physical performance, was at the core of exercise for centuries. It was probably at the core of your own childhood years and play. While daddy was working out his guns with dumbbells in the backyard, the little guy that you once were used to run, jump, balance, crawl, climb, carry, throw, and wrestle. Did you need machines or smartphone apps? Did you need to track anything? Were you thinking of what muscles you were exercising? The answer to all of these is no, and yet weren’t you having an absolute blast? Just because modern conveniences have obliterated the necessity to move (if you’re hungry, just click and order a pizza online, right?) and just because the fitness industry has led us to believe that fitness happens only indoors with equipment, doesn’t mean that our biological nature — our natural, evolutionary potential and need for complex and adaptable movements — has changed. We don’t have to accept our sedentary lifestyle and be hemmed in by the machines we have created in order to become fit. We don’t have to maintain a false dichotomy between strength and cardio, between the body and the mind, between fitness and health, or between exercise as something we do, and movement and physical activity as an expression of who we are. 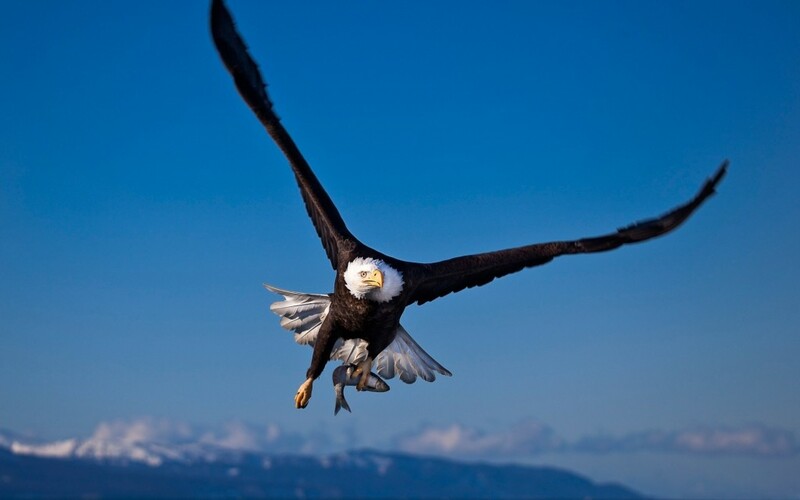 Alejandro Jodorowsky once said that “Birds born in a cage think flying is a sickness.” We have learned to neglect, distrust, and even fear our own natural movements. The truth is, we still have a real, natural potential for powerful, graceful, and useful movement. Move so you can be strong, and be strong so you can be free. Before starting the Natural Movement fitness trend worldwide in his late 30s, Erwan Le Corre has spent a lifetime pursuing a true, real-life fitness, from France to Brazil. Synthesizing his studies of ancient and modern physical training methodologies, martial arts, his experience in specialized sports and his expertise of training in nature, he founded what is now known as the MovNat method. You can read more about Erwan here & here.